Does everyone's babies wear clothes? Discussion in 'Baby Club' started by MrsE, Aug 21, 2007. I always see pictures of everyone's babies in pretty little outfits. He's a very warm baby so he gets too hot with more than one layer on and he's also very sicky too so has to be changed at least 4 times a day. rhys wore outfits when he was 1st born coz it was cold so i dress him in jeans and jumpers and coats. sorry bout the bad pic just took it now quickly! Bethanie always wears those too ^ she has one on right now in fact. I like to put her in pretty summer dresses or little jeans and t shirts but babies dribble! don't I know about that one lol. Charlie was a winter baby, and I always used to put her in baby grows. When we went out I sometimes put a little outfit on, but I think baby grows are fab! So cute and practical. Alex wore mostly baby grows for ages, he's in one right now!! 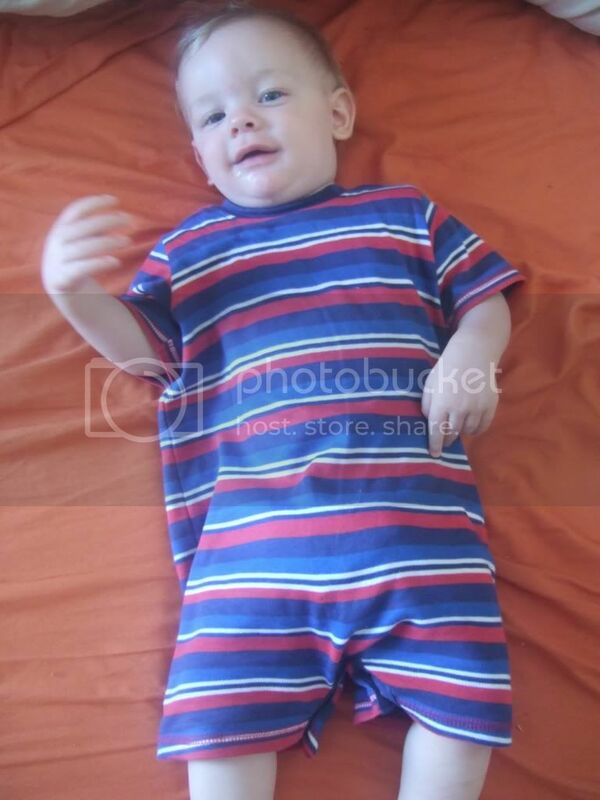 Kai lived in babygrows, if we were goin someone special ide put him in an outfit, but it was summer an hot when he was born so he was mainly in vests and babygrows! Infact now he walks round in the nudy (obv not when goin out ) he just dont like clothes lol! I love babies in baby grows. Ellie wears babygrows apart from when we go out!! We've inherited loads of clothes and had loads given and they're mostly outfits. They tend to sleep in babygros at night but are in outfits during the day because that's all they have. I love babygros and they're dead easy for changing and stuff.